Modern society has continually sent a clear message that a slender physique is the most attractive and desirable. This has not only driven the success of the diet industry as people have scrambled to attain the ideal body, but has also served as the catalyst for numerous eating disorders such as anorexia and bulimia. These disorders are often encountered in the world of competitive sports and bodybuilding as competitors develop a warped perspective on their relationship with food. The nature of competition draws driven, obsessive personality types who by fixating on performance goals often will develop an excessive desire to maintain what they describe as clean eating. If an athlete fails to obtain the ideal leanness which a sport requires, the reaction is often manifested in chronic undereating in a desperate effort to drop fat. The greatest irony is that many athletes and competitors who are regarded as having the most desirable physiques are beset with poor body image and low self-esteem. Another relatively common scenario is for a competitor to measure his or her self-worth by how rigidly he or she adheres to a strict meal regimen. Some individuals will have a strong desire to engage in emotional eating, indulging in what they deem forbidden foods, only to wallow in excessive guilt and self-doubt as a result. Eating disorders in general will cause an individual to feel tremendous anxiety when in social environments where food is served, so these situations are usually avoided. It is important not only to recognize the warning signs of an eating disorder, but to also understand how it can undermine one’s fitness goals. Furthermore, these disorders are extremely deleterious to one’s health and psychological well-being. Bulimia is characterized by compulsive episodes of excessive food consumption followed by purging behaviors such as laxatives, diuretics, excessive training or self-induced vomiting in an effort to compensate for the irregular behavior. The most common trigger for such binges is the excessive calorie restriction which is seen with dieting or at times with contest prep. The body responds to starvation by producing powerful cravings which may be irresistible. However, once the binge has occurred, the individual usually feels a sense of failure since the diet was not strictly adhered to, often causing more binge eating to occur. A period of purging follows soon afterwards, but the most common purging methods fail to rid the body of all the calories consumed. On average, laxatives rid the body of 10% of the calories eaten, while vomiting will eliminate 50% or fewer of the calories. Normal weight or slightly over ideal weight. Discolored teeth, tooth decay and mouth sores. Calluses or scars on knuckles. The hallmark of anorexia is excessive food restriction coupled with a severe, irrational fear of weight gain. These individuals have distorted body images which cause them to feel that they are overweight despite the fact that the majority of sufferers are underweight. 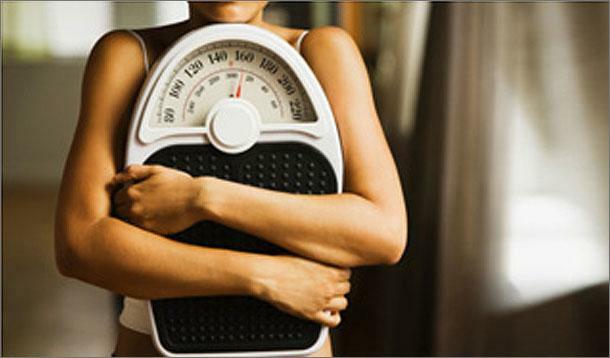 Anorexia sufferers are usually high achievers who harbor perfectionist tendencies which may lean towards or even reside within obsessive compulsive disorder. However, these individuals feel socially isolated and are overcome with a sense of failure and a loss of control over their own lives. Ironically, the anorexic behavior of forced starvation which gives one a sense of control eventually takes over and the individual is unable to interrupt the pattern. ← What’s Up With L.A. Weather?